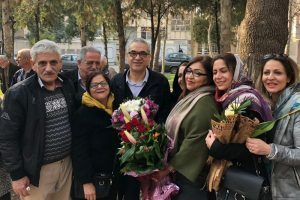 (BWNS) The trial of seven imprisoned Baha’i leaders began today in Iran. Initial reports indicate that the trial was marked by numerous violations of legal due process. After about three hours, the hearing ended. Authorities indicated that today’s proceeding was merely the “first session,” and no date for future sessions was given. “We understand that no observers were allowed in the court,” said Diane Ala’i, the Baha’i International Community’s representative to the United Nations in Geneva. “We find this completely outrageous, given that these seven have been held purely because of their religious beliefs, in total contradiction to any human rights standards. “We understand that even the lawyers had to argue their way inside the court – lawyers who in any case had virtually no access to the accused for nearly two years. “At the same time, the prisoners’ interrogators from the Ministry of Intelligence and a film crew were seen going in, raising questions about the nature of the trial,” she said. Ms. Ala’i also noted that an Iranian Web site linked to state-run television posted a story Monday evening announcing that the trial had already begun and listing the same baseless accusations made in the past against the seven. “In any event, all of these accounts point to a trial that is highly irregular, very similar to the show trials that have been held in Iran in recent months,” she said. The seven are Mrs. Fariba Kamalabadi, Mr. Jamaloddin Khanjani, Mr. Afif Naeimi, Mr. Saeid Rezaie, Mrs. Mahvash Sabet, Mr. Behrouz Tavakkoli, and Mr. Vahid Tizfahm. All but one of the group were arrested on 14 May 2008 at their homes in Tehran. Mrs. Sabet was arrested on 5 March 2008 while in Mashhad. 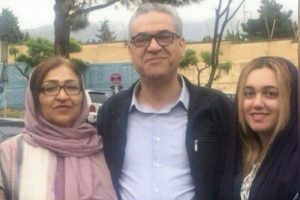 They have been held in Tehran’s Evin prison ever since, spending their first year there without formal charges or any access to lawyers. It is a shame that the Islamic court procedures prevent in this case outside observers from being present in the court. What is the Baha’i religious adjudication process by comparison? Are outside non-Baha’i observers allowed in the meetings of the National Assembly and the Universal House of Justice when they are adjudicating a person’s guilt for an alleged crime or offense? Are Baha’is allowed to be represented by an attorney in the Baha’i adjudication process? The Canadian media (www.cbc.ca) have gotten hold ot this as well – http://www.cbc.ca/world/story/2010/01/13/f-vp-stewart.html – Very good reportage (to use the French term) – worth a read!! In regard to a question here, there are no Baha’i Courts, no Baha’i judicial system exists. There are only the nascent institutions of Baha’i Administration consisting as bodies of nine people, democratically elected where such elections are legal. (They are not legal in Iran and some other places). Baha’is must honor the laws of the lands in which they live and accept the decisions of their country’s judicial system, even should the decision be flawed or prejudiced against them. sb notes : “…no Baha’i judicial system exists”. So does this mean the word “Justice” in the title of the international Baha’i Body , “The Universal House of Justice” means they make no judgements or adjudicate matters? Does this mean National Bahai Assemblies never adjudicate and settle matters judicially? Lets not confuse the issue: The Bahai’s are not on trial by the Universal House of Justice here. They are on trial in the judicial system that Iran has in place, and as human beings and citizens they have the right to have representation. If a Bahai is behaving in a way that conflicts with Bahai law, the proper procedure would be consultation to bring about a mutually beneficial solution. It would not be a “trial” and they would not need representation because their lives would not be threatened and their own well-being would be the primary focus of everyone involved. However in a situation where someone is involved in a Bahai consultation where their behavior is the matter of concern, that person may have whoever they like present, for support or representation or whatever makes them feel comfortable. Nevertheless, my original point remains the same, and no one can deny the fact that the Bahai’s are not being and have never been treated fairly by the Iranian “government”. I am not questioning the guilt or innocence of the Baha’i leadership in Iran. I am asking about the Islamic system in place in Iran vs. the Baha’i system of the administration of justice currently used or proposed by the Baha’i. Are the international human rights principals of adjudication which the Baha’is wish to see upheld in the Iranian Islamic courts…. are they part of the Baha’i religion’s adjudication process or proposed process? The Baha’i sacred book, the Kitab-i-Aqdas, mentions punishments of death, fines, branding, etc in a Baha’i system of justice . Currently these punishments are not in effect, though denial of marriage, association, and so-forth are. So it appears some kind of trial does occur and will happen in the future in Baha’i religious adjudication. So does the Baha’i method of adjudication allow for representation of an attorney for a client and access to the records of the proceedings? Robert is misinformed, no “trial” proceedings occur within Bahá’í Administration. Spiritual Assemblies employ the principles of “consultation” at all levels of Administration. Decisions made in consultation by Bahá’í Assemblies are issued as advisory guidance . Therefore, compliance to the guidance of Bahá’í Institutions is voluntary. Much like a citizen of the U.S. is innocent until proven guilty, by Bahá’í Institutions assume that the Bahá’í community adhere s to Bahá’í Law. Matters of serious crime are addressed under the jurisdiction of local or state authorities where a Bahá’í lives. In other words, the authority of Bahá’í Institutions is perceived as spiritual, not legal. Robert probably understands that no Spiritual Assembly in a democratic country can be compelled to give access to the records of its proceedings. I believe the Islamic courts say their verdicts are spiritual and that secular institutions have no right to interfere and compel them to hand over records. So if a Baha’i accused of wrong-doing has no right of a “trial” within the Baha’i community, cannot access the evidence and records held by the Baha’i bodies deciding the case, cannot cross examine witnesses, have representation by an attorney, by what reason can the Baha’i system of adjudication be seen any different in method than the Islamic system in vogue in Iran? The difference you say is that Baha’i bodies adjudicate advisory, and not compulsory verdicts which a Baha’i can chose not to follow. Am I mistaken to hold that there are penalties currently enforced in Baha’i community for those found guilty, and that there will be Baha’i courts which can implement the penalties of monetary fines, branding, and even the death penalty in a Baha’i theocracy which is the goal of the Baha’i? Robert says: “I believe the Islamic courts say their verdicts are spiritual and that secular institutions have no right to interfere and compel them to hand over records.” Baha’i Adminstration differs dramatically from his comparison in that Baha’is do believe that secular institutions have the right to exercise jurisprudence and jurisdiction should a crime be committed. As stated emphatically before, it is commonly known in Baha’i community that no Baha’i jurispridence exists and no “trials” or monetary fines are executed or exacted by the Administration. The Spiritual Assemblies are taught not to dwell in the accusatory, but to seek remedies for the spiritual causes of that may result in the breaking of Baha’i Law. (I will not respond further to this thread). Thanks for your thoughts. I was hoping that the Baha’i system of handling the breaking of spiritual laws would be different from that of the Islamic system. It appears from what has been shared here that the Baha’i system does not necessarily afford the accused of any of the commonly mentioned human rights in their religious process of adjudication, either that currently used or for the future so far as can be gathered from the Baha’i sacred literature online. In the Baha’i system, the accused is found guilty or innocent by a religious elect, but the accused have no implicite right to see the evidence, cross-examine witnesses, be represented by someone familiar with Baha’i law, etc. The Baha’i judgment (trial) is closed to the public, the Bahai community, and likely the accused. So what the Baha’i offer in place of the Islamic system of religious elect sitting in judgment of the accused seems to be little different than courts in Iran. Robert’s adversarial approach tries to cast doubt upon the Baha’i community’s processes. Baha’is seek an organic and spiritual transformation of human society in which human beings freely adopt and conform themselves to the priniciples that Baha’u’llah has brought. Punishments mentioned in the Kitab-i-Aqdas for crimes are for that future state of society. Today’s Baha’i institutions have no power of enforcement in criminal matters. There is no “religious elect” in the Baha’i Faith. Individuals are elected democratically, but it is not a lifetime status. Baha’i institutions and individual have, from the Baha’i writings, clear indications of their rights and obligations, some of which are enumerated in local Baha’i constitutions. Matters of religious status such as membership rights and marriage are an internal religious matter among Baha’is, not a criminal matter. Rights of membership are within the authority of the Universal House of Justice and National Spiritual Assemblies. In response to Bill’s statements: I hope my observations are not seen as adversarial. They are simply observations based on online sources and statements from the Bahai. If the Baha’i elect (those elected to act as judges, known as Assemblies) do not adjudicate internal matters using those methods highly regarded by human rights advocates (i.e. defendant’s rights), then how well based is the Bahai complaint that Bahai defendants in Iran should be afforded those same defendant human rights under another religious authority? Is this not hypocrisy? Should not the Bahai Assemblies be practicing a form of adjudication that affords those human rights for the defendant which the Baha’i complain those being tried in Iran should have? In fact, Bahai Assemblies have from time to time made determinations that a believer is guilty of criminal offenses, as well as moral offenses, and imposed a ruling that punishes the offender with little regard for the “human rights” of the defendant. I am sorry that your understanding of the Baha’si Administrative Order is so greatly confused. Perhaps “Bill” expressed what he did due to the content of your postings. Your posting seem dedicated to twisting what has been explained here into analogies that compared Baha’ is idealogically, to their persecutors. How untrue such an innuendo is this! Such an idea is immensely hurtful. I am again, sorry no one has been able to clarify matters for your understanding. However, all Baha’is stand together in recognition of your sacred right to investigate the truth with your own eyes. I will pray for you tonight. Claire: Thanks for your comments. I’m not twisting anything. Strange, all this paranoid attitude towards anyone who would ask questions that get at comparing how two religions adjudicate and what rights defendants are afforded. Well, my further investigation has shown Bahai do have trials (what Bahai call “consultations”) and the accused is found guilty or innocent by a religious elect (Assembly). But the accused have no right to see the evidence, cross-examine witnesses, be represented by someone familiar with Baha’i law, etc. No one here in this small forum has indicated the Bahai defendants within Bahai communities are afforded those kinds of rights. So, of course, one can draw the fair conclusion that Bahai is similar to Islamic practices in methods of adjudication. A Bahai theocracy sounds as scary as the Islamic theocracy which denies Bahais in Iran rights. Alas, Robert’s conclusions are once again utterly incorrect. I doubt anything that anyone may say here will convince him otherwise. However, a serious person making a sincere study of the elementary and obvious features of Baha’i Administration will see it cannot be compared to Islamic practices. The only place where there are Baha’i “defendants” and Baha’i on “trial” is in Iran. Robert may do well to remember this point. Those who claim Bahai individuals are never found guilty and punished for offenses within the Baha’i community by the Bahai “elect”ed officials are terribly misinfomed . Bahai members are given punishments following a form of trial in the Bahai community. Those accused within the Bahai community are defendants with no right to cross-examine witnesses, nor have access to statements made about them by the elect behind their back, and be represented by an expert in Bahai law., etc. This Bahai method of adjudication is very much the same as the Iranian Islamic practice so far as I can conclude, unless someone can share with me statements from the Bahai texts that guarantee defendant rights as defined by common human rights groups… and provide transcipts of cases handled by the Bahai elect to prove it otherwise.